There are moments along my journey that I will remember forever. Crossing my first finish line in the hills of San Jose hand in hand with one of my best friends Jacob. Completing Warrior Dash, crawling through the mud with my best friend and soul mate, Meghan. Walking through the doors of FNS on November 7th of last year is certainly one of those cherished memories. Since that day my life and outlook on fitness and this journey has drastically changed. My dreams became goals, some of them already accomplished and more that I am working toward completing everyday. Along this journey it has been important for me to remain humble. I receive compliments daily on the way I look and what I have accomplished. People always talk about my dedication and time spent in the gym and the number of events I do. Please know that I am nothing more than a normal guy, I have no super powers or some secret recipe for success. I choose to make this a priority in my life and the one thing that has enabled me to be as successful as I have been is my support system. I have the most amazing and loving wife, her patience and understanding is remarkable. My amazing boys are excited by fitness or gym time. My immediate family has been wonderful. Along this journey I have found other means of support as well, one being this blog as a way to express myself and hopefully impact someone’s life for the better. I tell my story in hopes that just one person can find that spark to change their life for the better. The community of athletes and coaches at FNS has opened doors that I never thought possible. I never even imagined completing a triathlon, let alone a half ironman. I am now working to complete what some would consider the Mt. Everest of fitness the 140.6 mile full Ironman Triathlon. These goals would have never existed with out the coaching and impact FNS has had on me. The sticker on my ride – showing my pride! I am a man that loves to show pride in things I am passionate about. For a few weeks I bugged Brian and Bo, coaches at FNS about getting some cool bumper stickers made so I could show my FNS pride on my ride! I am an impatient guy so I took it upon myself to see about getting these made. I sought out permission and was given the high-resolution image of the FNS logo and sent it off to the printer for 250 of the coolest stickers FNS has ever seen. I thought about what I could do rather than just hand them out to everyone, the wheels started turning and I thought how I could create impact within the direct community around us. The first thing that came to mind, was youth. In my opinion, youth, our children are our future. I grew up an active kid, playing various sports and I spent many afterschool hours playing some sort of sport or activity at a place we called the YAC or Youth Activity Center. This particular place happens to sit directly on a trail that I run often while training for my events and just getting in my cardio. I see the kids playing sports and enjoying themselves often on my drive home and even occasionally on my running adventures. The stickers I had created, I offered to the athletes of FNS for free. It was a way for me to say thank you to everyone for the amazing support that I had been given. I put a jar in the lobby and asked that anyone willing or able make a donation do so and all the funds would be taken to purchase some much needed sports equipment for the Santa Clara Youth Activity Center. I reached out to the center and they specified that they always had a need for equipment but at that moment it was badminton racquets and soccer balls. I noted that and continued to raise funds. A few months went by and the jar started to fill up. 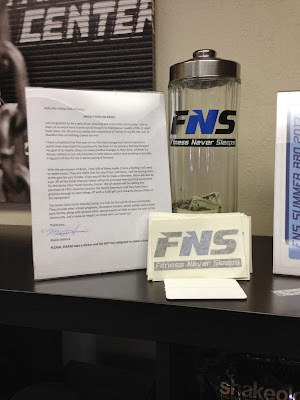 We raised a large some of money and with the help of a fellow FNS Athlete, Mike and the amazing establishment the Sport Basement we were able to purchase the needed equipment along with lots of other goodies! Tomorrow evening, October 9th, Brian of FNS, Mike from the Sports Basement and I will take these items and deliver them to the kids of the Youth Activity Center. I am so excited to see the faces of the kids! Creating impact within the community is rewarding on all levels, impacting the youth of our community is even more rewarding! I am so thankful that I found FNS and received my new lease on life. I feel an obligation to my family, friends and community to use my passion and drive to impact others lives for the better. To all the athletes of FNS, thank you so very much for all the donations, without all of you this wouldn’t be possible. I am eager to share photos of the drop off! Again – Special thank you to FNS – Fitness Never Sleep Training Center and The Sports Basement – Please visit their website for more info! Until Next Time – Warrior, Wildflower Finisher, Tough Mudder – Big Kahuna Finisher – Training for LIFE! I am a "big guy" on a shrinking mission.Father of two amazing boys and married to the love of my life! My entire life I have struggled with obesity. After reaching 452 pounds I decided my life needed a drastic change. Here is my journey for all to see.